The road to your wedding—the planning, the researching, and the saving—can be a long one. 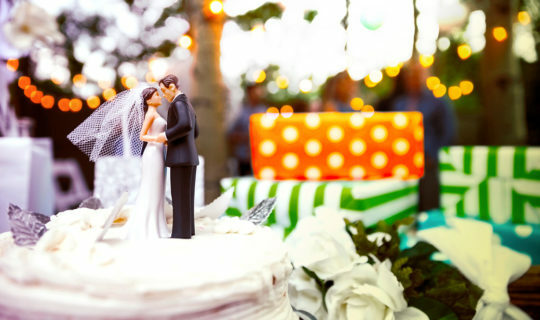 Many modern couples take months, or even years, to plan their weddings. And while it used to be tradition that a bride’s family would foot the bill, it’s become increasingly common for both families to pitch in. In some cases, the couple will handle costs themselves without any familial help (or with the help of crowdfunding campaigns for weddings). Before you plan and pay for your dream wedding, you should consider the cost of engagement rings. Find out tips for choosing the right engagement ring for you, your partner, and both your budgets. For couples who haven’t saved for the engagement ring in addition to the wedding, or for those who prefer not to dip into the wedding day coffers just yet, engagement ring financing is a smart move for budget buffering. Many jewelers offer financing options—sometimes with low- or 0% APR introductory rates—but accumulating an additional line of credit (and monthly bill) may not be ideal. Instead, couples who are already considering wedding loans can calculate the cost of the engagement ring (and wedding rings too) into the total amount they’d like to borrow. Spend What Is Comfortable: In the 1930’s, De Beers ran ads advising people to spend a month’s salary on an engagement ring. Today, the average amount spent on an engagement ring has increased to more than $6,000. This means some couples are spending much less than the old “2 months’ salary” rule of thumb—and others are spending more. Spend what you’re comfortable with and you’re more likely to start the joining of your finances off on the right foot. Learn Your Partner’s Ring Preference: Try to learn your betrothed’s likes and dislikes when it comes to engagement rings – the stone, the cut, the setting. If you want to keep it a surprise, employ a little help from friends or family. This will help you determine the style and size you want, and determine whether or not it fits into your budget. 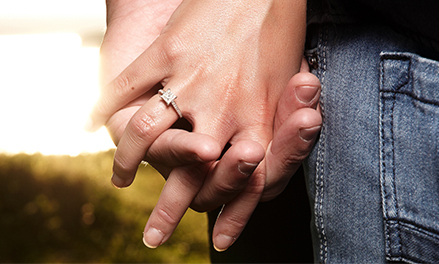 Know Your Financing Options: With a finite engagement ring budget, you might want to look for ways to cut costs. Buying at the jewelry store means you’re not only purchasing the stone, you’re also purchasing the band as well, which can come with strings attached. These include promotional introductory rates of 0% for six to twelve months that can increase to 25% interest if the ring isn’t paid off in time. One example that could save you some money is to purchase the diamond directly and to get it set by a jeweler separately. There are several reliable companies that sell certified, loose diamonds. You will still have to buy a band and have the diamond set, but the amount you save from buying the diamond separately could be meaningful. Now that you’ve set the budget and found the ring, it’s time to figure out how to choose an engagement ring you can afford. You might be tempted by store financing, but there are options that could be better for you and more flexible. One key to a happy marriage is financial stability. A great way to reduce engagement and wedding stress is to keep your purchases manageable and know your costs. Using a personal loan in place of engagement ring financing from a retailer is a step in the right direction, considering the average cost of an engagement ring can be pretty steep. One way to manage these wedding-related expenses is to choose a personal loan for an engagement ring. They may offer greater flexibility than some of the in-store financing options jewelers offer. This is especially true if in-store financing comes with strings attached, like promotional introductory rates of 0% for six to twelve months. If the ring isn’t paid off in that time, you could end up being charged 25% interest. By working with an established lender, you’ll be able to secure competitive interest rates with flexible loan re-payment terms. You also work with a loan professional who wants to get you a loan you can afford, instead of making a sale on a more expensive engagement ring. And, with a Discover personal loan, you may also secure a low interest rate, to help make it easier to pay for the reception or even a beach honeymoon and pay back the loan with manageable fixed payments. Choosing an engagement ring can be stressful, as can figuring out how to pay for it, but with a little planning you can get the ring your betrothed will love and start a smarter, safer financial future together.